How Will the Rollback of Dodd-Frank Affect Gold? In May, President Trump signed the rewrite of the 2010 Dodd-Frank law passed earlier by Congress with rare bipartisan support. The bill is the biggest rollback of bank rules since the financial crisis. According to the new law, lenders with less than $10 billion in assets will be exempted from the Volcker rule that bans proprietary trading. Moreover, the bill eases rules on all but the largest institutions, raising the threshold by which banks are considered systematically important and, thus, subject to tighter oversight from $50 to $250 billion in assets. The smallest banks between $50 and $100 billion were immediately freed of stricter regulations, while depositary institutions between $100 and $250 billion in assets will be exempt from them beginning in November 2019, although they could still be subjected to the Fed’s enhanced supervision in times of need. Last month, the Fed just unveiled a proposal for the implementation of several major provisions of the new bill. It is, therefore, good time to ask two questions. First, how will the rollback of Dodd-Frank Act affect the gold market? Second, are we safer a decade after the Great Recession – and what does it imply for the precious metals? The regulatory reform makes things easier for small- and medium-sized U.S. banks, as they will save millions of dollars in regulatory compliance costs. The banking sector will benefit at the expense of gold, which is considered as a safe-haven asset, hedging against the folly of the financial sector. Moreover, with eased regulations, banks could increase their lending to households and companies, which would support economic growth, deterring gold from shining. Some people say that the new bill is poorly timed and it may only add fuel to the fire, as banks are flourishing now. Indeed, let’s note that eased regulations will be implemented during Fed’s tightening of monetary policy, enhancing the positive impact of higher interest rates on banks (ZIRP and flat yield curve are detrimental for banks’ maturity transformation). However, thanks to the reform, the financial conditions could remain longer accommodative despite all the Fed’s hikes. So, it seems that the good prosperity may take longer. As gold needs recession or at least a slowdown to shine brightly, it is bad news for the bullion. Other analysts are afraid that, although small banks really needed some relief, the rollback goes too far, making the financial system more vulnerable to negative shocks. But the US financial system is more resilient than a decade ago. It’s less leveraged, more liquid and probably better supervised. Importantly, the shadow banking has been curtailed, while the macroprudential tools enhanced. As the chart below shows, the US banks have more capital as a part of their assets, while less non-performing loans in relation to total loans. 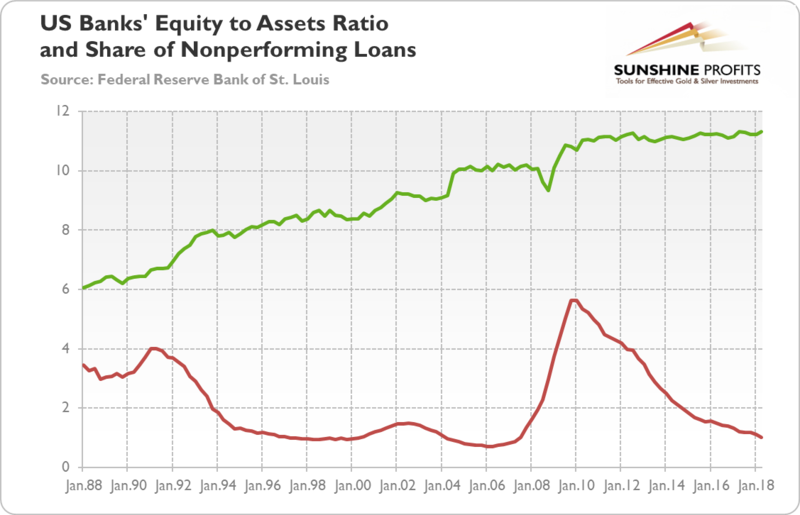 Chart 12: Total equity to total assets for US banks (green line) and nonperforming loans (past due 90 days plus nonaccrual) to total loans for all US banks (red line) from Q1 1988 to Q2 2018. However, situation in other countries looks worse than in the US. Their banking systems are exposed to highly indebted nonfinancial private sector or to the public sector. For instance, in the Eurozone (in Italy in particular), the sovereign-bank nexus constitute an important downside risk. The problem is that it’s not necessarily good news for gold. We mean that crises in emerging markets or in the EU are likely to strengthen the US dollar, limiting any potential upward in the gold prices. To be clear, we are not saying that the US financial system is perfectly safe. The old risks are not fully hedged, while new risks are emerging all the time, sometimes outside the radar of supervisors who tend to focus on old problems. Not to mention that new regulations often create negative unintended consequences, because market players try to bypass them, adding new and unknown risks to the system. And look at lofty asset prices – such high levels create a risk of correction (which has actually unfolded recently in the US stock market)! What we are saying is that the US financial system is safer, at the margin. The rollback of the Dodd-Frank should not change it, as it was a rather modest reform (relatively to other projects). The new bill should help the small and medium banks, but the big banks will remain under tight regulatory oversight. With eased pressure on them, banks are likely to expand their activity and allocate capital more effectively. If they expand credit action, the economic growth may remain solid. It should not help the gold prices. If you enjoyed the above analysis and would you like to know more about the macroeconomic outlook and the gold market, we invite you to read the November Market Overview report. If you’re interested in the detailed price analysis and price projections with targets, we invite you to sign up for our Gold & Silver Trading Alerts. If you’re not ready to subscribe yet and are not on our gold mailing list yet, we urge you to sign up. It’s free and if you don’t like it, you can easily unsubscribe. Sign up today!